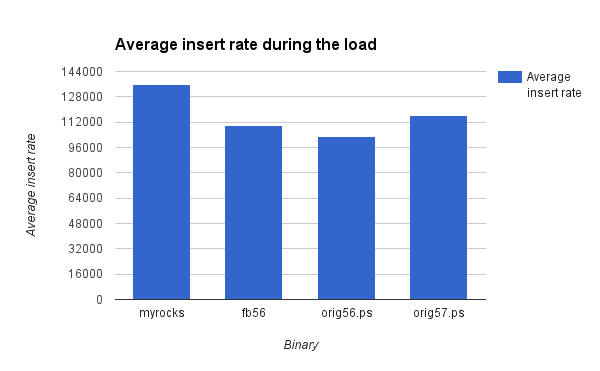 InnoDB compression in the Facebook patch for MySQL 5.6 is much faster for insert-heavy workloads than the same feature in upstream 5.6 and 5.7. Too bad those changes might not reach upstream. InnoDB transparent page compression is faster than non-transparent for write-heavy workloads assuming that feature is OK to use on your servers. QPS for MyRocks suffers over time. We have work-in-progress to fix this. Otherwise it is already competitive with InnoDB. Compression with MyRocks is much better than InnoDB for linkbench data. That has also been true for real workloads. 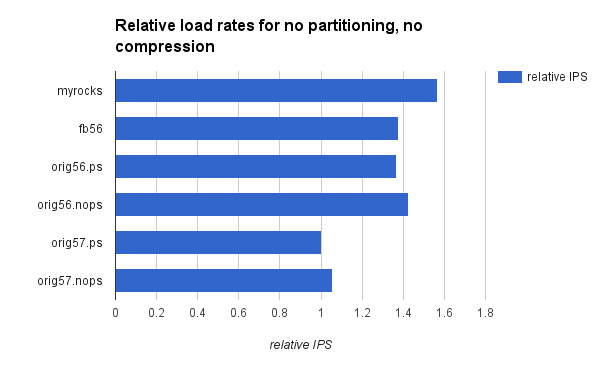 Load rates are higher for compressed InnoDB tables when partitioning is used for 5.6 but not for 5.7. I didn't debug the slowdown in 5.7. It has been a win in the past for IO-bound linkbench because it reduces contention on the per-index mutex in InnoDB. Work has been done in 5.7 to reduce the contention on the per-index mutex. The test was done in two parts. 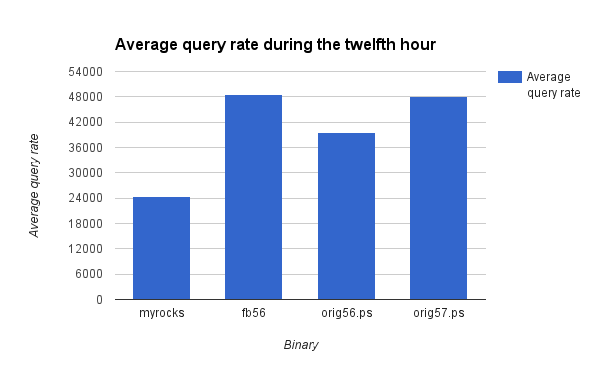 First I measure the load performance, then I run the query test for 12 1-hour intervals. The data below is the insert rate from the load (load ips), the size after load (load gb), the QPS rate during the second and twelfth 1-hour runs (2h qps, 12h qps) and the size after the second and twelfth 1-hour runs (2h gb, 12h gb). And for people who want graphs this has the average insert rate from the load and the average query rate from the twelfth hour for the p0.c0 test (no partitioning, no compression). I ran linkbench overnight for a database that started at 100G using MySQL 5.7.8 and InnoDB transparent page compression. After ~24 hours I have 1 mysqld crash with nothing in the error log. I don't know if that is related to bug 77738. I will attach gdb and hope for another crash. For more about transparent page compression read here, here and here. For concerns about the feature see the post by Domas. I previously wrote about this feature. On the bright side, this is a great opportunity for MyRocks, the RocksDB storage engine for RocksDB. Then I ran 'dmesg -e' and get 81 complaints from XFS on the host that uses transparent compression. The warnings are from the time when the benchmark ran. My other test host isn't using hole-punch and doesn't get these warnings. I get the same error message below from a host with CentoOS 6.6 host using a 3.10.53 kernel. From my host without hole-punch where the files for the table are ~44G. And the host with it where the files for the table are ~104G according to ls but are much smaller because of the holes. I don't like the vmstat output either. On the host that uses transparent page compression swap is being used and that started during the linkbench load. It is not being used on the other host. Doesn't look right. This is from a host with CentOS 6.6 and the 3.10.53 kernel. After running for a few hours with transparent page compression mysqld got stuck. I looked in the database error log and there was the standard output from threads getting long waits on InnoDB synchronization objects. I attached gdb to look at thread stacks, and that took ~15 minutes just to attach. Fortunately I got stacks before needing to reboost this host. All threads appear to be blocked on calls into the kernel. This gist shows two of the threads -- one is stuck doing aio and another trying to do fallocate64 called from os_file_punch_hole. Deadlocked mysqld + reboot server == victory? I filed bug 78277 for this. After the reboot dropping a ~72G ibd file that had been using hole-punch took ~3 minutes. Then I created an 80G file and dropping that took 10 seconds. It a good idea to have database files that take minutes to drop given that InnoDB and filesystem state can get out of sync during a crash requiring manual repair. I have two CentOS 6.6 servers with the 3.10.53 kernel and XFS. The host in the previous section doesn't use partitioning. The host in this section uses partitioning and transparent page compression. They both get InnoDB deadlocks but this host was healthy enough the the InnoDB background thread was able to kill the server. This was triggered by a DROP DATABASE statement. I don't have thread stacks but will guess that a file unlink operation took too long or got stuck. Because DDL isn't transactional the data dictionary isn't in a good state at this point. Some of the per-partition ibd files are missing. Reboot #2 has arrived. Did kill -9 on mysqld and the process is still there in state Z after 40 minutes. Delete the database directory but space is still in use according to df. I assume that space won't be released until the zombie process goes away. I give up on trying to use transparent compression on this host. The good news is that features in the pending 5.7 release look great. More good news is that InnoDB transparent page compression might be faster than the original compression feature assuming your storage system supports it. The bad news is that there are significant performance regressions for low-concurrency workloads. I previously reported this for 5.6 and 5.7.5 and have yet to see progress. While the focus on high-concurrency workloads has been important, we can't lose this much performance at low-concurrency. Insert rates for 5.7.8 are much worse than for 5.6. The insert rate for 5.6 are between 1.07X and 1.77X faster than 5.7. The Facebook 5.6 build is always faster than 5.6.26 and 5.7.8, except when transparent compression is used. While transparent compression might be a lot faster than non-transparent compression I share the same doubts as Domas about whether we can use this feature in production. The feature requires either a filesystem that is happy when doing a holepunch on every write or a filesystem that is really a key-value store where the key is pageID, the value is a page and the page will be compressed on write with minimal roundup to meet alignment requirements. By roundup I mean that when a 16kb page is compressed to 11kb, it is written as 11kb when rounded up to the next 512b sector or 12kb when rounded up to the next 4kb sector. With 2X compression, that page would be split and the ~5.5kb compressed output for each post-split page would be rounded up to 8kb. AFAIK there isn't a GA solution for the filesystem that doesn't require holepunch on write. There is a proprietary solution (filesystem & storage device) that is not yet GA from one vendor and the open-source solution might be bcachefs assuming it gets sufficient support to reach GA.
InnoDB page compression adds latency to query processing. By non-transparent compression I mean the original page compression for InnoDB where a compression factor (2X, 4X, 8X) is declared per table. Both transparent and non-transparent page compression add the latency of decompression after page reads. There is other latency that only occurs for non-transparent page compression. By latency I mean work done by threads handling SQL statements and these are things that I see when looking at PMP stack traces. Page images are optionally written to the redo log to avoid the risk of changing the zlib library during crash recovery. I always disable page image logging. When the per-page compression log is full all changes must be applied to the page and then the page is compressed. When a page doesn't compress enough (see #2) then a page split is done and the split pages must then be compressed. When a page split is done the per-index mutex is held so other threads can't access that index until the operation is done. I frequently use partitioning to reduce the impact from contention on the per-index mutex. There is a bit more work to manage both the uncompressed and compressed LRUs. The linkbench test was run with maxid=2000001, loaders=1 & requesters=1. Otherwise the default settings were used. The InnoDB buffer pool was large enough to cache the database, the binlog was enabled but the binlog and InnoDB redo log were not synced on commit. I set many other my.cnf values to match what we use in production but don't list them here. The p0.c0 test was repeated for upstream 5.6.26 and 5.7.8 with and without the PS enabled (performance_schema=0, 1 in my.cnf). I didn't set any other options for the PS. The load rate is reduced by about 5% when the PS is enabled with default options. orig56.nops, orig56.ps - upstream 5.6.26 without and with PS enabled. The my.cnf file I used was based on what we use in production and is here. orig57.nops, orig57.ps - upstream 5.7.8 with non-transparent compression, without and with PS enabled. The my.cnf file I used was based on what we use in production and is here. The test was done in two parts. First I measure the rate at which one thread can load the database. Then I measure the average QPS sustained for one hour. The data below is the insert rate from the load (load ips), the size after load (load gb), the QPS rate during the 1-hour run (1h qps) and the size after the 1 hour run (1h gb). The relative ips column is the insert rate for that configuration divided by the rate for upstream 5.7.8. These rates are large and we have lost a lot performance at low-concurrency in 5.7.8. Most of the loss is not from the performance schema. A graph for the p0.c0 test (no partitioning, no compression) showing relative insert rates. It took me too long to figure this out. If you have family sharing enabled for iTunes and try to play content from the library of another member in the plan then you will get a dialog asking for your password followed by another dialog claiming the computer is already authorized and the content won't play. You have to download the content, you can't stream it, but that isn't the most annoying part. The shared content is hard to find. iTunes seems to change the UI each in random ways each year. This advice works for version 12.2.2. Click on Episodes at the top to switch from Seasons and see the episodes. RocksDB has work-in-progress to support transactions via optimistic and pessimistic concurrency control. The features need more documentation but we have shared the API, additional code for pessimistic and optimistic and examples for pessimistic and optimistic. Concurrency control is a complex topic (see these posts) and is becoming popular again for academic research. An awesome PhD thesis on serializable snapshot isolation by Michael Cahill ended up leading to an implementation in PostgreSQL. We intend to use the pessimistic CC code for MyRocks, the RocksDB storage engine for MySQL. We had many discussions about the repeatable read semantics in InnoDB and PostgreSQL and decided on Postgres-style. That is my preference because the gap locking required by InnoDB is more complex. MongoRocks uses a simpler implementation of optimistic CC today and a brief discussion on CC semantics for MongoDB is here. AFAIK, write-write conflicts can be raised, but many are caught and retried internally. I think we need more details. This is a recent example of confusion about the current behavior. Thanks go to Anthony for doing the hard work on this. After evaluating results for MongoRocks and TokuMX I noticed that the disk write rate per insert was ~3X larger for MongoRocks than TokuMX. I ran tests with different configurations to determine whether I could reduce the write rate for MongoRocks during the insert benchmark tests on a server with slow storage. I was able to get a minor gain in throughput and a large reduction in write amplification by using Snappy compression on all levels of the LSM. config1 - Use a larger memtable (200M versus 64M) and larger L1 (1500M versus 512M). config2- Use a larger memtable (400M versus 64M), larger L1 (1500M versus 512M) and Snappy compression for all levels. This continues the use of the insert benchmark to understand performance for different MongoDB engines with slow storage. I previously explained load and query performance for a server with PCIe flash and documented the impact of too frequent invalidation in the plan cache. In this post I explain load and query performance for a server with a disk array -- SW RAID 0 across 15 SATA disks. write-optimized engines (TokuMX, RocksDB) do much better than b-trees (WiredTiger, mmapv1) for secondary index maintenance on large databases because they don't do read-before-write. InnoDB might be unique among the b-tree implementations -- it has an optimization to save on disk reads via the insert buffer. MongoDB invalidates cached plans too quickly, but that has been fixed recently. The performance impact from this can be much worse on slow storage. TokuMX 2.0.1 has a CPU bottleneck from the partial eviction code that also hurts range query performance. It also wasn't doing index-only access plans for queries that should be index only. RocksDB is very competitive for this workload. It was usually the first or second best on each test. mmapv1 can become single-threaded courtesy of the write lock not getting released when disk reads are done during index maintenance. See server-13325. TokuMX and RocksDB on slow storage do loads almost as fast as on fast storage. With 3 secondary indexes TokuMX gets 98% of the rate it had on fast storage and RocksDB gets 83% of the rate it had on fast storage. RocksDB loses more because of compaction stalls. We are thinking of ways to make this better. For write intensive workloads RocksDB loses more performance than TokuMX when the oplog is enabled. TokuMX loaded 500M docs at 44571/second with the oplog enabled versus 48515/second with it disabled. RocksDB did 24923/second with it enabled and 36759/second with it disabled. The percentages for rate-with-oplog-enabled / rate-with-oplog-disables is 91% for TokuMX and 67% for RocksDB. TokuMX has more optimizations for the oplog. I wasted a few weeks of machine time getting this data. My first attempt used the same setup as the fast storage test -- 2B documents with a 256 byte pad column. The load with 3 secondary indexes would have taken much too long for mmapv1 and WiredTiger but I didn't realize this until more than one week into the load. I changed the load to 500M documents and even then I wasn't willing to wait for mmapv1 and WiredTiger to finish with 3 secondary indexes so I stopped the load early for them. I was more interested in incremental load than bulk load performance otherwise I would have created the indexes after loading the table. I then lost another few days and repeated all query tests because I had a lousy setting for /sys/block/$device/queue/read_ahead_kb. This hurt mmapv1 the most on query tests. RocksDB was mostly immune to it because it sets POSIX_FADV_RANDOM by default for user readsI didn't notice this until late in the process. I did not repeat the load. I spent a few more days improving the RocksDB configuration for disk arrays and finally another day repeating tests with the oplog disabled. This is a typical experience for performance tests, tests will be repeated. All tests use my fork of the insert benchmark for MongoDB. The test servers have a disk array (SW RAID 0, 15 SATA disks), 32 hyperthread cores and 64G of RAM. The servers with fast storage had more of everything: PCIe flash, 40 hyperthread cores, 144G of RAM. The CPU on the fast storage server was one generation newer than the CPU on the slow storage server. The mongod configuration was described in the two previous blog posts, but I limited to database cache to 16G versus 32G for the server with fast storage. Loads were done with 10 client threads. The query tests are described in the Test Details section of the previous post. I had lots of data and a nice graph to share for the load. Then I realized that a lousy setting for read_ahead_kb made my load results bogus. I repeated the load tests for TokuMX and RocksDB with better settings. I did not repeat the load for WiredTiger and mmapv1 because that would take too long. I also stopped the load early for WiredTiger and mmapv1 so the query tests were run with 352M documents for mmapv1 and 419M documents for WiredTiger versus 500M documents for RocksDB and TokuMX. The oplog was enabled for these tests, but fsync was not done on commit. RocksDB loses more from the oplog than TokuMX. RocksDB gets 67% of the insert rate with the oplog enabled compared to when it is disabled, while TokuMX gets 91% in that comparison. TokuMX doesn't have to delete old data from the oplog, it can drop/truncate old partitions. While RocksDB must delete old entries one at a time. The wkb/o (rate for bytes written to storage per insert) value is reduced almost in half for RocksDB with the oplog disabled. For an insert only workload documents are written at least twice (once to the oplog, once to the database) ignoring writes from LSM compaction in RocksDB. So when the oplog is disabled half of the writes are removed. The rkb/o rate drops by ~6X for RocksDB when the oplog is disabled. The i1.q10 test shows how bad the impact can be from too-frequent plan invalidation. The problem is that the 3.0.X version of MongoDB that I used invalidates query plans after 1000 documents have been changed. That happens quickly for the workloads I tested and QPS drops when plans are recomputed. The table below shows the rates for inserts and queries per second with the default setting ($engine.nofix) and a workaround ($engine.fix). I was unable to use the workaround for TokuMX 2.0.1 as it is based on an older version of MongoDB. But I don't think TokuMX suffers from this problem. The query tests are described in the Test Details section of the previous post. The tests were run after the load with 3 secondary indexes in the sequence and here I share the results for i0.10, i1.q10, i10.q1 and i10.q0. The tests were only run for the configuration with 500M documents and a 256 byte pad field but the load was stopped early for WiredTiger and mmapv1 (see the section on Load Performance) so they had less data. The queries used in this test are interesting. The secondary indexes were small enough to be cached for RocksDB, TokuMX and WiredTiger but only if I didn't use too much memory for the block caches. I used 16G which left almost 48G for the OS filesystem cache. To be precise, this was enough memory to almost cache the secondary indexes for TokuMX. The queries use covering secondary indexes so they should be index only, but were not for TokuMX for reasons I don't understand. The extra disk reads done by TokuMX were not good for QPS. The secondary indexes were not small enough to be fully cached by mmapv1, but a lot of the data from them was in cache. With mmapv1 I don't have to worry about splitting RAM between uncompressed pages in the block cache and compressed pages in the OS filesystem cache. Also with mmapv1, decompression on page read wasn't needed because it doesn't use compression. This might explain why it had the highest QPS. AFAIK, WiredTiger doesn't use block compression (snappy in this case) for index pages so it has less overhead after reading the data compared to RocksDB. Perhaps because I have never used mmapv1 or MyISAM in production I am always happy to get a result where they are the fastest. The queries were not index only for TokuMX and QPS suffers. They were index only for RocksDB, WiredTiger and mmapv1. This has data from iostat and vmstat including absolute and relative (normalized by IPS or QPS) rates. The columns are explained in the Load Performance section. TokuMX does ~1037X more disk reads per query than RocksDB. That is a problem. mmapv1 does ~8.4X more disk reads per query than RocksDB and that is much less of a problem in this case. RocksDB uses about 2X more CPU/query than mmapv1 while TokuMX uses about 4.8X more CPU/query than RocksDB. The one insert thread was rate limited to 1000 inserts/second but WiredTiger and mmapv1 were unable to sustain that rate. This test was run with the fix to avoid too-frequent query planning. The QPS for TokuMX suffers because the query isn't index only for it. QPS for mmapv1 suffers because the database is much larger than others and because of the RW lock which is locked in W mode when disk reads are done for secondary index maintenance as explained in a previous post. TokuMX does much better than RocksDB here because RocksDB has more write amplification, TokuMX has more optimizations for the oplog and RocksDB must maintain one extra index. The insert rates for WiredTiger and mmapv1 are much lower because they do read-before-write during secondary index maintenance. The write efficiency can be seen in the wkb/o column where it is ~5X larger for RocksDB than TokuMX and ~23X larger for WiredTiger than TokuMX. The read efficiency can be seen in the r/o column where WiredTiger is ~40X larger than TokuMX, mmapv1 is ~18X larger than TokuMX and RocksDB is ~1.7X larger than TokuMX. WiredTiger and mmapv1 also use much more CPU per insert than TokuMX and RocksDB. I am not sure why the insert rate for RocksDB here is higher than i10.q0, perhaps that is due to variance from compaction and a longer running test would have fixed it. This test was run with the fix to avoid too-frequent query planning. The insert rates are similar to the rates for i10.q0. I use CoW-R and CoW-S to distinguish between two approaches to doing copy-on-write for a B-Tree. CoW-R stands for copy-on-write random and is used by LMDB and WiredTiger. Page writeback is not in place. The writes use the space from dead versions of previously written pages. Background threads are not used to copy live data from old log segments or extents. This tends to look like random IO. When the number of pages written per fsync is large then a clever IO scheduler can significantly reduce the random IO penalty for disks and LMDB might benefit from that. WiredTiger has shown that compression is possible with CoW-R. But compression makes space management harder. CoW-S stands for copy-on-write sequential. New writes are done to one or a few active log segments. Background threads are required to copy-out live data from previously written log segments. Compared to CoW-R this has less random IO at the cost of extra write-amplification from cleaning old segments. It allows for a tradeoff between space and write amplification -- more dead data can be allowed to reduce the frequency of cleaning and the write amplification overhead. I am not aware of an implementation of CoW-S for a B-Tree. In CoW-R and CoW-S B-Trees the file structure is page based. In the worst case a page is written back to disk when with one dirty row and the write amplification from that is sizeof(page) / sizeof(row). This can be large when a row is small (128 bytes) and a page is 4kb or 8kb. Write optimized approaches avoid that source of write amplification as they only write back the changed rows. Examples of this includes an LSM like RocksDB and a log structured product like ForestDB. Alas, there is no free lunch. While these avoid the write amplification from page writeback, they add write amplification from compaction in an LSM and log segment cleaning in ForestDB. WiredTiger has the best range query performance followed closely by RocksDB. While the LSM used by RocksDB can suffer a penalty on range reads, that wasn't visible for this workload. mmapv1 did OK on range query performance when there were no concurrent inserts. Adding concurrent inserts reduces range query QPS by 4X. Holding exclusive locks while doing disk reads for index maintenance is a problem, see server-13225. TokuMX 2.0.1 has a CPU bottleneck that hurts range query performance. I await advice from TokuMX experts to determine whether tuning can fix this. I have been using a configuration provided by experts. 1i.10q - 1 insert thread, 10 query threads. The insert thread was rate limited to 1000 documents/second. Run for at least 1 hour. 0i.10q - 0 insert threads, 10 query threads. Run for at least 1 hour. 10i.0q - 10 insert threads, 0 query threads. Run to insert at least 10M documents. 1i.10q - this is the same as the previous 1i.10 test except I increased the value of internalQueryCacheWriteOpsBetweenFlush to avoid the IO overhead from re-planning queries too frequently as explained in a previous post. Alas, this cannot be done for TokuMX 2.0.1 because that option doesn't exist in the older version of MongoDB it uses. QPS for TokuMX is low. There is a CPU bottleneck. More details at the end of this post. These are results for the 10i.1q test. WiredTiger has significant variance for the insert and query rates. Bugs have been opened for this problem and progress has been made but I think some bugs are still open. The query rate for mmapv1 is very low as described earlier in this blog post. These are results for the first 1i.10q test. The insert thread is rate limited to 1000 documents/second. WiredTiger and RocksDB sustain higher query rates. TokuMX (because of the CPU bottleneck) and mmapv1 (because of the larger database and RW lock) sustain lower query rates. These are results for the 0i.10q test. WiredTiger and RocksDB get about 10% more QPS compared to the 1i.10q result. The QPS for mmapv1 improves by ~4X because it isn't slowed by the RW lock from the insert threads. TokuMX continues to suffer from the CPU bottleneck. 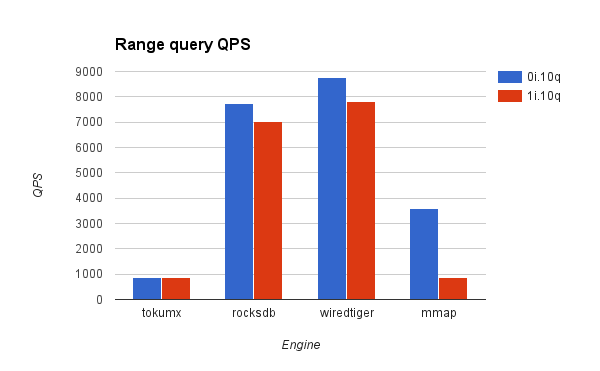 WiredTiger and RocksDB sustain the highest QPS because they do the fewest storage reads per query. The range read penalty from an LSM doesn't occur for this workload with RocksDB. The CPU/operation value is more than 25X larger for TokuMX (0.085000) than for the other engines (0.003104 for RocksDB). TokuMX is also doing almost 4X the disk reads per query compared to RocksDB. I hope we can figure this out. The storage reads per query rate is much higher for mmapv1 in part because the database is much larger and the cache hit rate is lower. These are results for the 10i.0q test. The insert rate improvement versus 10i.1q is larger for TokuMX than for RocksDB. I assume that TokuMX suffers more than RocksDB from concurrent readers. WiredTiger still has too much variance in the insert rate. The CPU utilization and storage IO per insert is lower for RocksDB & TokuMX. This is expected given they are write-optimized and benefit from not having to read secondary index pages during index maintenance. mmapv1 suffers from doing more disk reads and using more CPU. These are results for the second 1i.10q test. The QPS rates for RocksDB, WiredTiger and mmapv1 are better than in the first 1i.10q test because mongod was changed to cache query plans for a longer time. I want to understand why TokuMX uses more than 25X the CPU per query than other engines. The high CPU load comes from eviction (flushing dirty data so block cache memory can be used for disk reads) but it isn't clear to me why eviction should be so much more expensive in TokuMX than in WiredTiger which also does eviction. RocksDB doesn't show this overhead but it does compaction instead of eviction. I reloaded the TokuMX database with 2B documents, let it sit idle for 1 day and then started the 0i.10q test. From a flat profile with Linux perf the top-10 functions are listed below. Then I ran PMP and from stack traces see that eviction is in progress which explains why QuickLZ compression uses a lot of CPU because data must be compressed during eviction. From stack traces I also see that the query threads are stalled waiting for eviction to flush dirty pages before they can use memory for data read from storage. This is a common place where a database engine can stall (InnoDB and WiredTiger have stalled there, maybe they still do) but the stalls are worse in TokuMX. I will let the 0i.10q test run until writes stop and see if the query rate increases at that point.